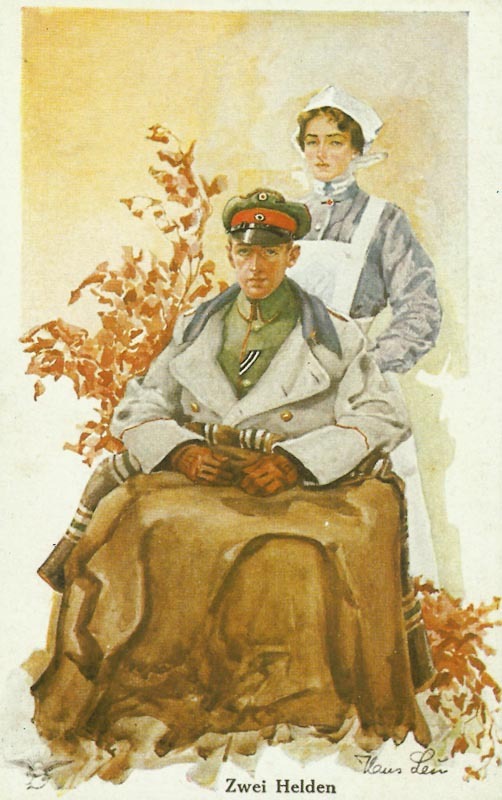 German postcard with the popular nurse motif. Flanders: British trench raid south of Bethune-La Bassee road. Baltic Provinces: Russian Twelfth Army Chief of Staff orders secret police, informers, patrols and officers to deal with anti-war leaflets in XIII Corps. Turkey: 106 Royal Marines and Greek irregulars occupy the Long island in gulf of Smyrna entrance (until May 27). Mesopotamia, Kut: Flour ration cut to 4oz per man, Indian issued opium pills against hunger. Western Front: 9 French aircraft bomb Contlans and Arnairlle rail stations and factories at Rombach (night April 16-17). Austria: War Profit Taxes imposed.